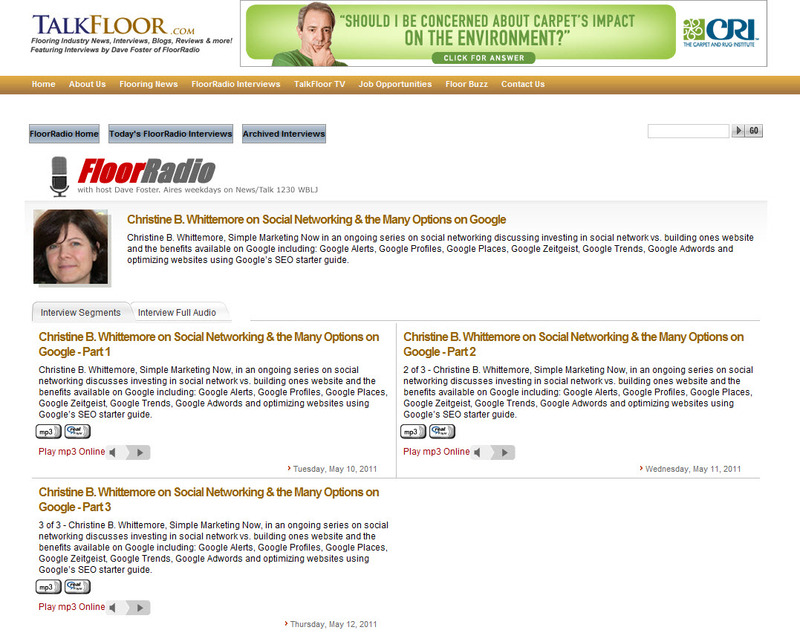 After a long hiatus [our last interview took place in December 2010], Dave Foster and I resumed our social media marketing discussion series, continuing where we left off in Google for Visibility: TalkFloor Social Media Marketing Series as we explored Google for search and discovery. 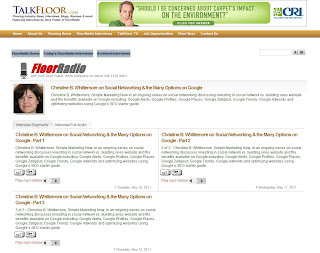 Christine B. Whittemore, Simple Marketing Now, in an ongoing series on social networking discussing investing in social network vs. building ones website and the benefits available on Google including: Google Alerts, Google Profiles, Google Places, Google Zeitgeist, Google Trends, Google Adwords and optimizing websites using Google’s SEO starter guide. This was a wild discussion that went into a multitude of Google related directions. Here are my notes. I hope you enjoy the interview. How to connect with customers when they start at a search window? See Improving Visibility Online: Advice For Businesses. How to grow your fans, subscribers, followers, etc.? See How Do I Increase My Followers? We discuss the importance of understanding what your business objectives are, who are your customers and what matters to them as well as how you differentiate yourself in marketplace. From there you can develop a plan and more successfully integrate your online work into your overall business. It also avoids the 'seat of the pants' element that Dave refers to. Social profiles are easy to set up; but it's also really easy to waste time and become frustrated with how to make them meaningful to your business. 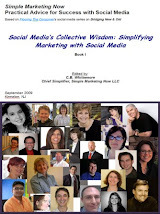 Here is the link to the video - Social Media Revolution 2 - the Refresh - I mention. It's approximately 4 minutes long and refers to possibly the most well respected networker and relationship builder of all time: Dale Carnegie. Born in 1888, his best seller How To Win Friends and Influence People was written in 1936. That is what's at the core of what social and digital tools enable: getting to know customers, building a relationship and establishing trustworthiness. I've noticed a trend with adding social icons to a website to look hip and socially connected. Unfortunately, when you click on those icons and check out the profiles, you realize that there's nothing going on. The icons are purely cosmetic when there's opportunity to do so much more! Spend time up front with your business objectives, understanding you customers, your competition, your strengths.. You want a website that offers potential value with great (blog) content that you can share on other platforms. If you have nothing to share, you'll have a hard time sustaining social efforts long term. It's all interconnected. It's easy to share/interact on your website by including a Facebook widget or your Twitter feed [just make sure you are creating meaningful content!]. Beware of autoposting because communities are not all the same. The dynamics differ from Facebook, Twitter to LinkedIn, etc. In this segment, we recapped several of the highlights from the Google for visibility interview [e.g., Google profile and Google Places, Google SEO starter guide] and I recommend that you check out the links and notes from that session [link in first paragraph]. Since then, I've written How To Manage Your Online Reputation which reinforces how to keep track of what's happening online, and the value of Google alerts [and checking on your Google juice]. Beware of taking short cuts to improve search engine rankings. Google has changed its search algorithm in response to short cuts JC Penney and others had taken [see The Dirty Little Secrets of Search from the New York Times]. Spend time exploring Google search. It changes periodically and you are sure to find valuable tools to use. Note that we now get blended results where you'll see a mix of social results [which may include recommendations based on your social circle], video, photos and what's relevant to your IP address in addition to more traditional search results. This will vary depending on how popular your search query is. Notice “instant” results – which offer suggestions as you type a query. This is a quick way to get feedback on search terms. For a more objective result, log out of Google, try different browsers [which you may be able to access at the bottom of the left sidebar in the 'something different' section. This changes. Think 'wildcard'!]. You can change your location to see different geographic relevant results. Click on 'more search tools'. I find the 'timeline' option fascinating. You can look for historic relevance. For carpet, for example, you'll notice references dating back to 500 BC! You can also specify time ranges. We discussed real world benefits to using Google for Search and Discovery. The flooring world is filled with wrong customer product expectations [I'm sure this is true in other industries]. Wouldn't it be nice to address those expectations up front and prevent problems? [Here are the frustrations my Mom encountered when she was in the market for flooring!] Help your customers and address their concerns in FAQs that are readily available on your website. Offer recommendations. Anticipate what they will experience. Listen to the words they use. Our online presence has to be about our customers. 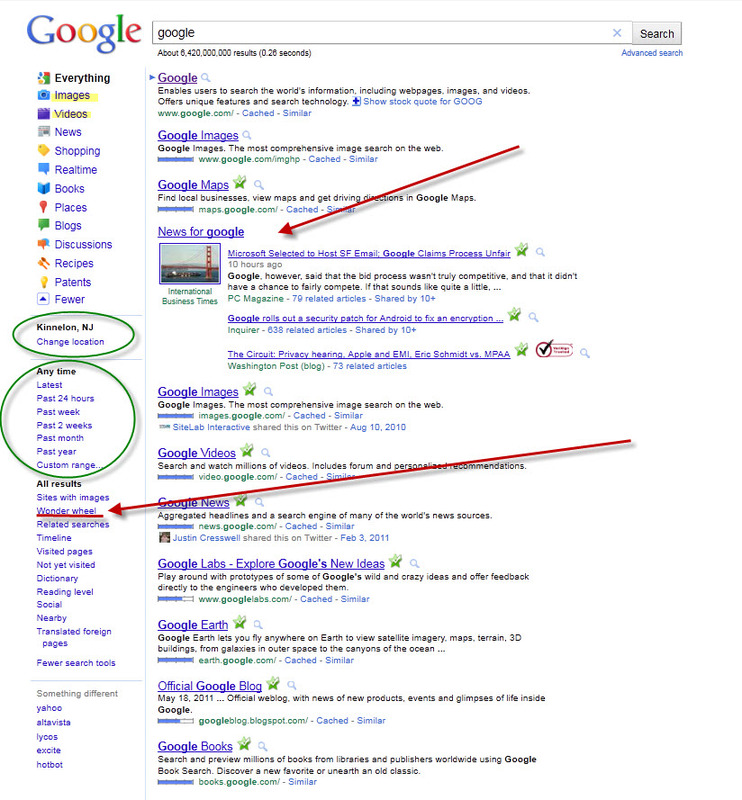 By the way, I recommend a timer or alarm clock to help you manage your time as you explore Google search results. You'll want to spend time searching particularly in the discovery phase as you validate keywords and topics relevant to your marketplace and customers. Dave and I discuss geographic search, Google Places, searching based on location. It's good to experiment and see how results differ based on changing location. The New York Times had a fascinating article titled Advice From a Sticky Web Site on How to Make Yours the Same which brought up the value of "local local" and connecting with potential customers on a very local level. See my post How Are You Finding New Customers? ; it refers to the stat that 97% of local customers use online media to research businesses in their community. "If you can't be found, you don't exist!" You might also enjoy Results Revolution's Plan for the New Economy With the Niche Model. Try Google Insights for Search to compare search volume patterns across specific regions, categories, time frames and properties. Here are ideas on how to use Google Insights for Search. I did a comparison of Mohawk flooring vs. Shaw flooring vs. Beaulieu carpet using Google Insights. Note that it's a North American marketplace. Go explore and drill down by region or state. 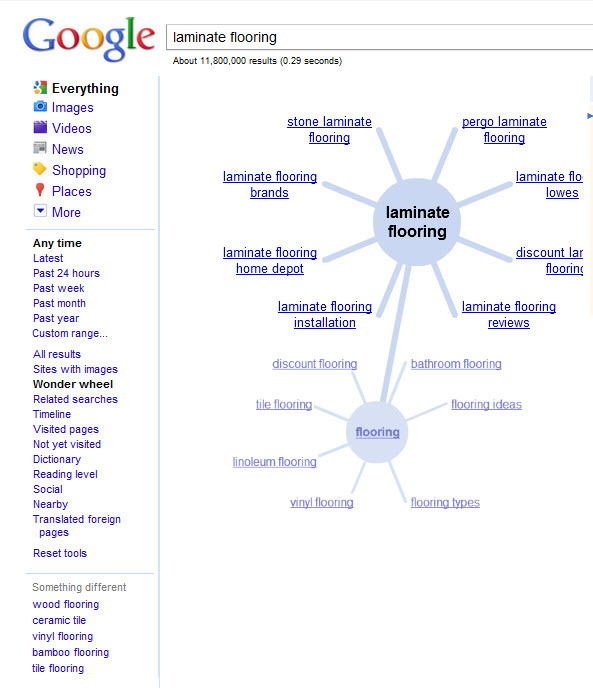 You'll enjoy John Simonson's post titled Google Insights for Search for carpet, hardwood & laminate flooring for 2010. The Google Adwords Keyword Tool is not only immediately relevant for PPC, but it allows you to better understand keywords, variations [e.g., plural vs. singular] and how competitive the words are. For example, did you know that hardwood is more competitive than carpet? The research allows you to discover patterns, better understand your competition, find the words that are meaningful to potential customers when they start the search process and go from a general one word search to increasingly specific 4, 5 and 6 word searches. See How to Use Google Adwords Keyword Tool for SEO. Yes, all of this takes time, but it allows you to find better qualified leads. You are focusing on quality rather than quantity and 'qualified potential customers'. It's part of your preparation work and ensuring that all of your marketing efforts work harder on your behalf! 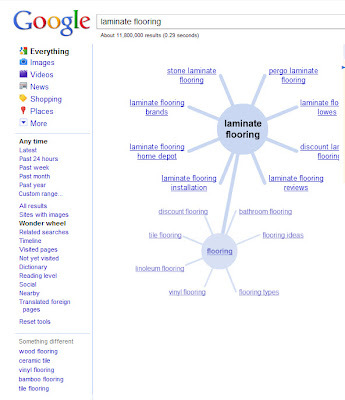 Google puts valuable information into your hands with these search and discovery tools. They allow you to an determine how to connect with customers with relevant, meaningful content. You can be smarter with what you offer customers. Next Google as productivity enhancer. What's your reaction to this conversation about Google for search and discovery? How do you use Google? Which tools have you found most helpful? Have you been surprised at what you discovered while searching? Added 5/20/11: Google has introduced the Inside Search Blog - the official Google Search blog. Blogging and Community: Worth Embracing!